Embark on a journey around the world and be fascinated by its amazing wildlife. Do you know where the panda lives? Do you know where the babirusa lives? Do you know what a babirusa is? 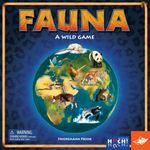 In the game Fauna, you are not expected to know all the answers, simply gather your wits and make an educated guess. You are right on target? Great! You are close? That’s good too, since you score partial points. The more you play the better you get. Playing Fauna involves some fun betting for points, but don’t get cocky, as this may cost you your hide.